Writer Ugo Foscolo was born Niccolò Foscolo on this day in 1778 on the island of Zakynthos, now part of Greece, but then part of the Republic of Venice. Foscolo went on to become a revolutionary who wrote poetry and novels that reflected the feelings of many Italians during the turbulent years of the French revolution, the Napoleonic Wars and Austrian rule. His talent was probably not sufficiently appreciated until after his death, but he is particularly remembered for his book of poems, Dei Sepolchri - Of the Sepulchres. After the death of his father, Andrea, who was an impoverished Venetian nobleman, the family moved back to live in Venice. Foscolo went on to study at Padova University and by 1797 had begun to write under the name Ugo Foscolo. While at University he took part in political discussions about the future of Venice and was shocked when Napoleon handed it over to the Austrians in 1797. He denounced this action in his novel Ultime lettere di Jacopo Ortis - The Last Letters of Jacopo Ortis. Foscolo moved to Milan where he published a book of sonnets. Still putting his faith in Napoleon, he decided to serve as a volunteer in the French army and was later wounded and taken prisoner. When he was released he returned to Milan to carry on writing. In 1807 he wrote Dei Sepolchri, a patriotic poem in blank verse. Written as a protest against Napoleon’s decree forbidding tomb inscriptions, it considers using the past as a refuge from the misery of the present and the darkness of the future. He was appointed to the chair of Italian eloquence at Pavia and delivered a lecture urging his fellow countrymen to study literature to help both individual and national growth. Napoleon then issued a decree abolishing the chair of Italian eloquence at all universities. 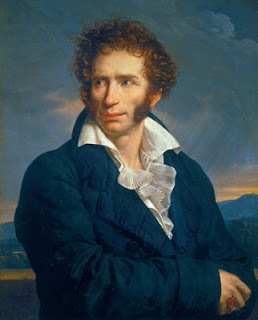 When the Austrians arrived in Milan, Foscolo moved to Switzerland and then went to live in London, where he died in 1827. In 1871 his remains were brought back to Italy by order of King Victor Emmanuel II and he was buried with great ceremony in the Basilica of Santa Croce in Florence . The main building of Padua University, where Ugo Foscolo studied, is Palazzo del Bò in Via 8 Febbraio in the centre of Padua. The building used to house the medical faculty and you can take a guided tour of the building and see the lectern used by Galileo when he taught there between 1592 and 1610. The street named after the poet in Milan, Via Ugo Foscolo, links one side of the Galleria Vittorio Emanuele II with Piazza del Duomo. Work began in 1865 to build the elegant, glass roofed Galleria, an arcade of shops and restaurants that links Piazza della Scala with Piazza del Duomo. Work on the Duomo began in 1386 but the magnificent church was not completed until the 19th century, when Napoleon, who was crowned King of Italy there, ordered the façade to be finished. Ugo Foscolo is an ancestor of mine of whom I am very proud.